I was a most precious teen when I first became acquainted with the works of the Marquis de Sade and must honestly confess that I was not quite prepared for what I would find within the pages. Somewhat innocently, I had anticipated much sauce and very little else besides. Whilst there is unarguably plenty of the former, I was badly misinformed on the latter and it all proved a little too much for my impressionable eyes, eventually leading me to abandon my efforts to read de Sade and scurry back to the Brontes. Much older and perhaps a smidgen wiser, I have since revisited de Sade's writing and though he will never be a favourite of mine, he is undeniably an important literary voice in the Georgian era. A writer of far more than just the erotica that is associated with him, the Marquis wrote prolifically on politics and philosophy, whether free or, as was so often the case, incarcerated. 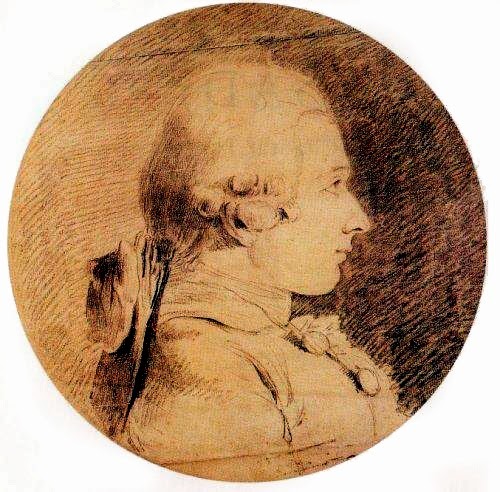 The Marquis de Sade spent many long years behind the walls of numerous asylums and today marks the anniversary of his death, bringing to an end thirteen years of confinement in the Charenton asylum. Here the septuagenarian conducted an affair with the thirteen year old Magdeleine Leclerc, daughter of one of the asylum employees. He continued to write and when allowed, even staged plays performed by a cast of his fellow inmates. Understandably, however, the elderly man was not happy with this limited existence. Plagued for years by ailments including asthma, gout and failing sight, he petitioned on numerous occasions to be released and on each occasion his pleas fell on deaf ears. Shattered by the death of his favourite son, Louis-Marie, in 1809, de Sade's mood sank ever lower in the final years of his life as he went through the motions of life without hope of respite. Towards the end of November 1814, de Sade's health took a turn for the worst and he retired to bed, complaining of severe pains in his chest and stomach. He did not linger but died at ten o'clock on the evening of 2nd December, never having secured the freedom he so longed for. He left behind a will stating that his body should not be anatomised or opened for any reason yet his words were ignored, and several years after his death, de Sade's skull was removed from his corpse. It went on something of a tour and became a cause célèbre in itself but that is a tale for another day. The is a society of de Sade snd some followers who extoll him as a philosopher. I am afraid I can't give much credit to anyone who liked inflicting pain on others. Some of his practices are bizarre and disgusting. When he said that by way of pain one arrives at pleasure, he seems to have meant the pain of others gave him pleasure for he is not known for inflicting pain on himself, If ever there was a man who looked at females as objects -- literally using the buttocks of his mistress as a table on which he placed hot food-- it was Sade. There are those who say he has been misunderstood and are trying to change the perception of the man. I'm not a fan of the Marquis; I do find him a fascinating figure, but not one who can be warmed to! Poor little girl, nobody protected her from the nasty little pervert! A grim fate, I think. Fab stuff! Is it trite of me to say 'what a nutter'??? Not trite at all, perfectly true! A thoroughly nasty piece of work who deserved no sympathy!